Most of us think that estimating the costs of a kitchen remodelling project is easy, since most companies offer quotes and free measures. Although this fact is true to some extent, it may not always be easy for you to fix a budget, especially if you are looking forward to having a specific design of your choice. Suppose two kitchens occupy equal floor space, but their remodelling costs may not be the same. The difference in expenses may largely be influenced by the inclusions and materials. 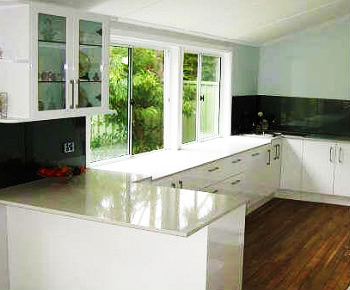 The foremost thing you need to keep in mind is that the average costs of kitchen renovation available on Internet are prepared by assuming that a remodelling will include new appliances, electrical installation & plumbing and tiling. However, averages can be deceiving and therefore, should only be used as indicators of standard rates. Recognise the fact that a smaller project will cost lesser than a larger one, and you can reduce the prices even further by retaining the existing appliances, if they are in good condition. While obtaining quotes, choose materials and inclusions that would allow you to have an opulent looking cooking space for a reasonable budget. The visual elements can make a huge difference in the costs. For instance, stainless steel benchtops are far more expensive than their laminate counterparts. So if you wish to keep your expenses low, go with the latter. Also, make sure you choose melamine cupboard doors instead of polyurethane ones. However, it can cost you later if you compromise with the quality of the drawers to prevent your budget from ballooning. This is because cheap drawers have fragile bottoms which are bound to break or buckle even under moderate load. On the other hand, good quality metal-sided drawers may have a higher price tag, but they are fitted with runners and also solidly constructed. When you are picking door hinges for your kitchen renovation project, be wary of the ones that look alike but differ significantly in quality. Try to purchase the top grade variants that are a bit expensive, because they are value for money and will eliminate future repair costs. Last but not the least, discuss your requirements and budget with the hired professional extensively without leaving any stone unturned. He or she will be able to guide you with the best materials that will not only suit your budget, but also meet your requisites adequately.